If you have a barber chair from the 1950’s or earlier, you might be wondering how much it is worth. The answer can be slightly complicated, but after considering a few important factors you can be on the way to selling your antique barber chair for the best value in no time! If you are only wanting the look of an antique barber chair without the actual history than a replica will be much cheaper and can look just as beautiful; but if you want a genuine antique, you will want to first make sure that you are buying an authentic vintage item. The authenticity of your antique barber chair can be tough to determine, but an easy way to quickly separate the authentic antiques from the replicas is by the year they were made. Real barber chairs were not invented until the 1900’s, so anything purportedly dated before that is probably not going to be authentic. 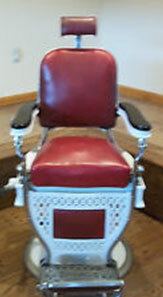 Like any other vintage item, certain brands or “designers” of barber chairs will trigger more interest. A quick search at the antique barber chairs presently available for sale online shows you a few of these brands – Koken, Paidar, and Theo. A. Koch are especially in-demand. 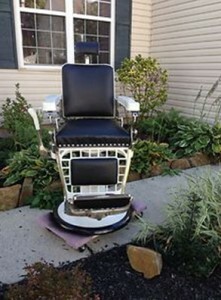 Even though your barber chair may be an antique, functionality is still important. What separates a barber chair from a regular chair is that it is fully adjustable depending on the size and height of the person sitting in your chair. This means that for the chair to be worth its full value, the hydraulics in the center piston of the chair should be in good working order. In layman’s terms, an average sized person should be able to sit in your chair, adjust it to his or her height requirement, and have the chair remain sturdy and in place throughout the hair cut. Quality of upholstery is also important to consider, but upholstery can be replaced much more easily than the mechanics of the chair itself. Even when fully functional and in good condition, antique barber chairs can range anywhere from roughly $600 all the way up to $6000 in value, so be sure to do your own research before listing your relic for sale in person or online!